It’s the heart of spring home selling season. 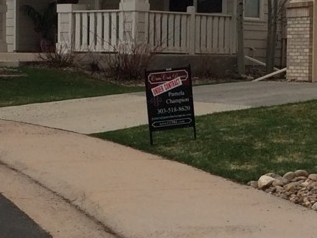 For Sale signs in The Meadows are up and down more than roller coasters at Elitch Gardens. You’re probably wondering, with all of this competition how will I ever sell my home? Don’t fret. The house selling process can be tricky but you can get a leg up on the competition by following these three tips for selling your house. Obviously when selling your house you are going to show it which means you are going to need to clean it. I’m not talking the kind of light cleaning you might do before family and friends come over, you are going to have to deep clean your home. Now you can choose to do this your self but if you are like me and freak out due to the overwhelming task than you can choose to hire a home cleaning service. It also helps to declutter your home by starting to pack and organize your stuff. Remember, when showing and selling your house less is more. The deep cleaning doesn’t stop at the inside of your house. Take a look at your landscaping to make sure everything looks well kept. Do your best to make sure you have lush green grass. Declutter the outside of your home and remove any trash or debris that could make your house a potential eye sore. Curb appeal is very important when it comes to selling your house. The first impression your prospective buyers will have of your home is crucial and it can be a big turn off if your yard is not looking well kept. A few years ago, when it came to selling your house, neutral colors were the way to go. Now that times have changed and people are okay with having bold colors, you don’t have to flip out about painting everything beige or white. However, if you have bold colors you do have to make sure that everything in the room matches. Make sure the colors in your home flow nicely. It’s easy to want to ask for more money. But if you price your home too high, you might turn away buyers. If you price your home close to what it should sell for, your house will sell fast, and you might make more money in a bidding war. Remember, just like you’re trying to make money, buyers are looking for value. If you’re like a lot of people in The Meadows, and are thinking of putting your house on the market, I hope these three tips for selling your house will help you have success.